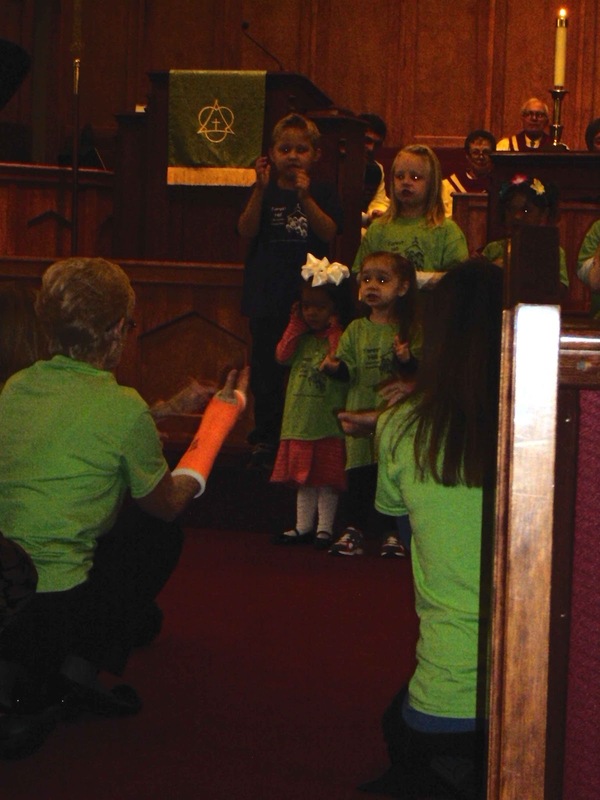 Today, we had the opportunity to watch Katy sing with the rest of her Preschool during church. 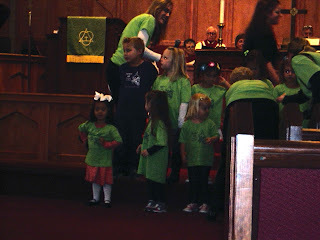 So, we decided to be Methodist for the day and watch Lil' Miss sing. The kids sang "Jesus Loves Me" and "This Little Light of Mine." While she didn't really sing (at least, not that we could tell), Katy did far better than I had first expected. Katy was the stereotypical kid who was waving to her parents in the audience. She stood up front of the church, with her classmates, she didn't try to run towards us and she didn't cry. Katy was pretty interested in watching the other kids sing, so oftentimes, she was turned around watching her friends sing, instead of singing herself. Overall, though, I'd consider that a win!